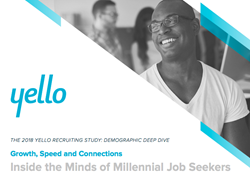 Whether it’s understanding where job seekers learn about your company, interview process speed or candidate communication preferences, the 2018 Yello Recruiting Study: Demographic Deep Dive shares supplemental data to shape best-in-class talent acquisition strategies. Yello’s talent acquisition platform enables the world’s leading brands to deliver personalized candidate experiences to every job seeker, resulting in quality hires and faster fills. The centralized platform is easy to use, enabling recruiters to collaborate with one another to attract and engage top talent. Key recruiting metrics provide meaningful insights that lead to more informed, data-driven decisions while staying on budget. Visit www.yello.co.